Black Panther has been making plenty of headlines of late, and with good reason. Writer-director Ryan Coogler looks to be assembling a dream cast for the highly anticipated movie; Lupita Nyong'o is in talks to star, frequent Coogler collaborator Michael B. Jordan has been confirmed, and it looks like they might be joined by John Boyega. 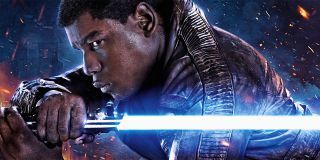 Evidence suggests that the Star Wars actor could be getting ready to make his Marvel Cinematic Universe debut; Best of Marvel noted that Boyega posted a photo labelled 'Meeting' to his Snapchat account soon after Marvel President Kevin Feige started following the actor on Twitter, while Heroic Hollywood report that "hot, unconfirmed scuttlebutt" points to Boyega meeting with Coogler for Black Panther. This is just a very big rumour for now, but adding Boyega to Black Panther would be an amazing get for Marvel; even before Star Wars he was one of the most exciting young actors around, and he would be a great choice to star in any superhero movie. That there's a chance it will be with the likes of Chadwick Boseman, Nyong'o, and Jordan only makes his possible MCU introduction more exciting. Directed by Ryan Coogler and starring Chadwick Boseman, Black Panther is released in UK cinemas on February 9, 2018 before opening in US theatres on February 16, 2018.